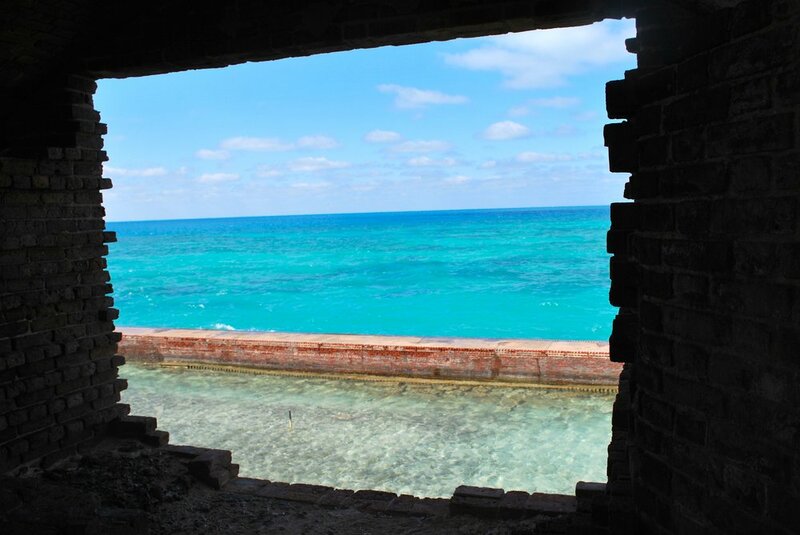 If you’ve actually heard of Dry Tortugas National Park, count yourself among the very few. If you’re just discovering it, congratulations! It’s a secret worth knowing. Located 70 miles from Key West, Dry Tortugas can be visited on a day trip, or if you’re really adventurous, you can camp and experience what it would be like to live on a near deserted island! As folks say about many destinations, getting there is half the fun. You could take a 4-1/2-hour (roundtrip) ride abroad the Yankee Freedom II ferry out of Key West. But if the budget allows, why not go all out? Board a seaplane with Key West Seaplane Adventures and make the 45-minute trip to the island, where you’ll touch down on the turquoise blue waters and float into shore. I can still remember the looks on my sons’ faces, ages 9 and 11, when I explained that we’d be landing on the water! KidTripster Tip: You can pick up Junior Ranger workbooks at the visitor center, so that your kids can earn their Junior Ranger badges. I’d highly recommend this activity as it’s an engaging way to learn the history of this unique place. In addition to the regular workbook, you also can complete the Underwater Explorer Junior Ranger Program or the Junior Ranger Night Explorer Activity Book, if you’re camping overnight. It's best to download them in advance. 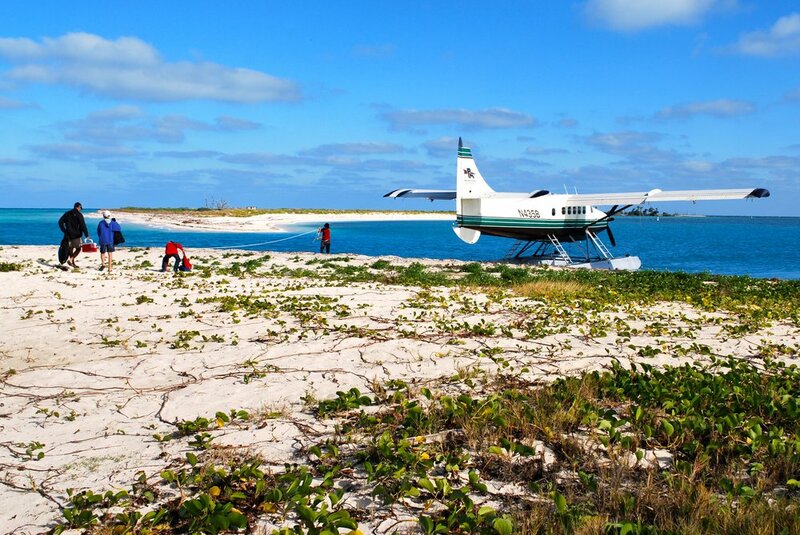 As you approach Dry Tortugas with no other landmass in sight, you truly start to appreciate its remoteness. You’ll also marvel at it’s pristine beauty; the shades of blue water here are indescribable. The 100-square-mile park is mostly open water with seven small islands. 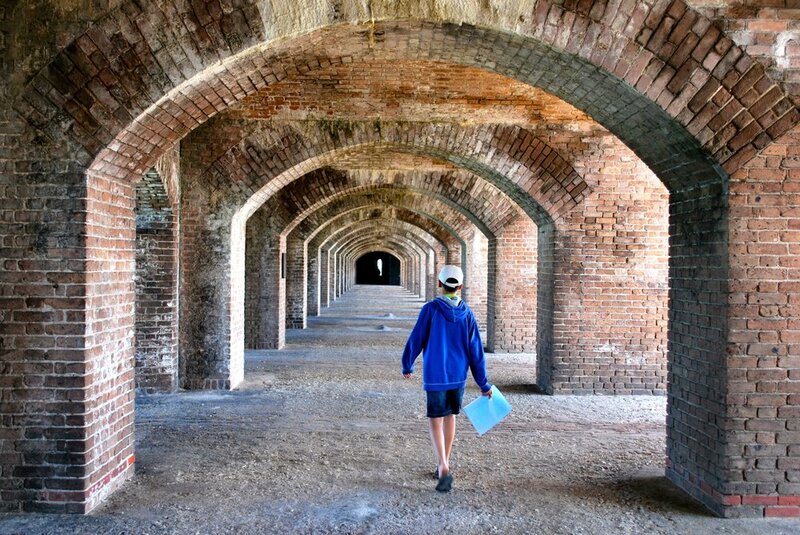 Dry Tortugas actually has an interesting history to learn. 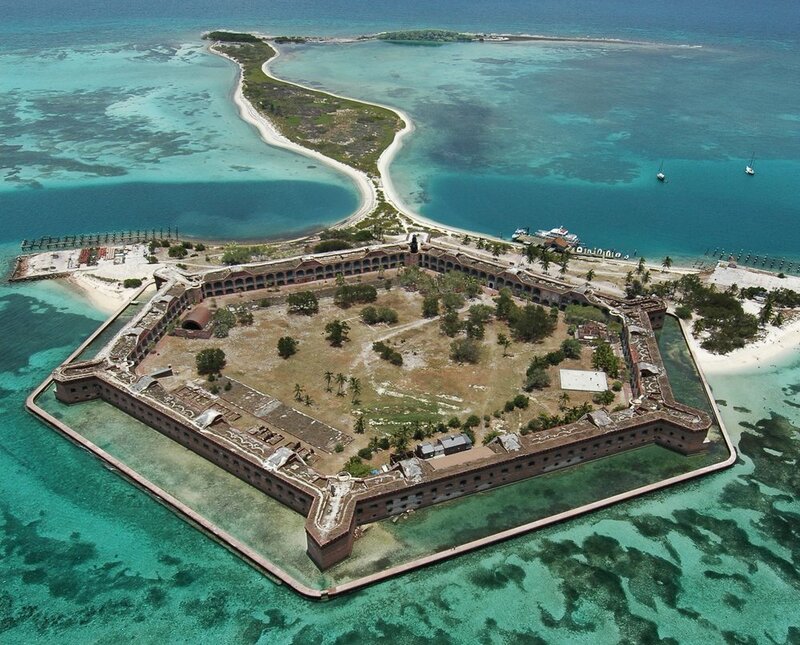 On Garden Key (the second largest of the islands), you’ll find Fort Jefferson, a large 19th century fort once used as a prison during the Civil War. KidTripster Tip: Make sure to bring a carry-on bag full of necessities, as there are no services on the island. Include food, drinks, swimsuits, towels, and sunscreen. If you fly, the pilot will provide you with a cooler. If you’re here just for the day, do make time for snorkeling in the crystal clear water after touring the fort. While you can’t swim in the moat that surrounds the fort, you can swim on the outside of the moat. You'll see reef squid, nurse sharks, hogfish, and maybe even the endangered American crocodile that lives in the waters of the park. In the coral areas, you’ll also find colorful parrot fish, angel fish, triggerfish, and others. KidTripster Tip: Only one American crocodile has been spotted on Garden Key; however more are possible at anytime. Though typically shy and solitary creatures, they are wild and should never be approached. KidTripster Tip: Remember, don’t touch the coral or any of the marine wildlife. While you shouldn’t fear attack, brushing against jellyfish, sea urchins, venomous lionfish, and the like should be avoided. And yes, you may see turtles! The Dry Tortugas was originally named Las Tortugas for the sea turtles that swim and nest here. In all, there are five species of turtles in the national park, including Green and Loggerhead. Kayaking and paddleboarding are great ways to enjoy the water here, but you do need to bring your own equipment on the ferry. Check in with the rangers at park headquarters inside Fort Jefferson to get your free but required boat permit. Kayakers also must carry personal floatation devices. Staying overnight on Garden Key has to be one of the most unique camping experiences in the national park system. It’s a self-serve operation, right down to leaving the $15/night fee in an envelope at the fee station; bring proper change. You need to bring your own everything: drinking water, food, tent, match-light charcoal (no wood), and other supplies. The eight sites are assigned on a first-come/first-serve basis; there’s also a shared overflow camping area. Facilities are primitive with composting toilets and grey water for dishwashing. All trash must be taken with you when you leave. KidTripster Tip: If you’re coming with a group, you must make reservations in advance for the group site, which accommodates 10 to 20 people. KidTripster Tip: Whether you’re traveling by ferry or plane, make sure you inform the company that you plan to camp. There are gear restrictions, and only a certain number of campers are allowed per day. You can fish for your dinner, but you’ll need a Florida saltwater fishing license, unless you’re under 16 or a Florida resident over age 65. Spearfishing and lobstering are not allowed. Click here for additional rules. KidTripster Tip: You need to protect your food from rats by storing it in hard-sided containers. At night, you’ll be treated to a star-filled sky, far from urban sources of light pollution. Soak it all in! Key West is a 2-1/2-hour drive from Florida’s mainland and the disembarkment point for both the ferry and seaplane. Ferry cost: Youth (4-16) $125; Students (17+ with ID) $165; Adult $175; breakfast and lunch included. If you’re camping, the ferry charge is an extra $20/person. Seaplane half-day tour cost: Youth (under 2) Free; Youth (12 & under) $263.60; Adult $329, plus $10 park entrance fee for passengers over age 16. KidTripster Tip: If you have a National Parks Pass, show it when you check in, and the entrance fee of $10 will be deducted from your transportation cost. KidTripster Tip: You also can arrive to Dry Tortugas by private boat. If you plan to recreate or stay in the park, you need to check in at park headquarters inside Fort Jefferson and pay park and boating permit fees. Editor Shellie Bailey-Shah travels to national parks with her husband and two sons. Of the more than 30 parks that she has visited, she says Dry Tortugas may be the most unique.